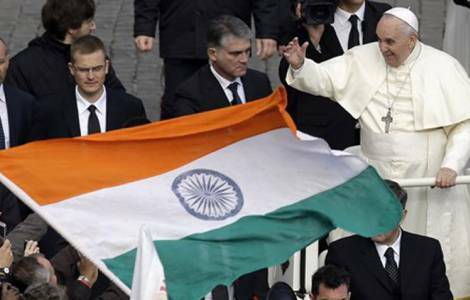 New Delhi (Agenzia Fides) - The Catholic Church of India said it was disappointed that Pope Francis will not be visiting India as part of his South Asia trip. During his visit he will go to Myanmar and Bangladesh. The leaders of Indian Catholics were in touch until recently with the government to bring the Pope to a country where Catholics constitute the third largest group, with about 28 million followers. But they were not able to obtain a commitment. Bishop Theodore Mascarenhas, Secretary General of the Indian Bishops' Conference (CBCI), told Fides: "It was with a heavy heart, we received the news that the Holy See cannot visit India. A Holy Visit would have been a prestige for the whole country in the eyes of the world. The Pope is visiting two smaller countries and not India: as an Indian, it hurts". The previous papal visit to the sub-continent was in January 2015, when Pope Francis visited Sri Lanka for the canonization of India-born priest Joseph Vaz. Consultations for the papal visit began in earnest a year ago, when Pope Francis declared in October 2016, on the papal plane on his way back from Azerbaijan, that he would "almost certainly" visit India and Bangladesh next year. According to protocol, a papal visit is a "state visit" and the Head of State must send an invitation to the Vatican asking to host the Pope. Archbishops and Cardinals had formed delegations to meet President Pranab Mukherjee and the Prime Minister’s Office, but they returned without a commitment from either office.